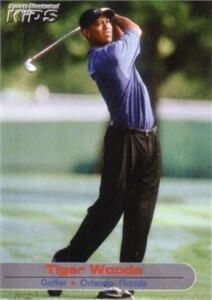 2002 Sports Illustrated for Kids card of Tiger Woods. BOTTOM EDGE OF CARD HAS SMALL TEAR NOT VISIBLE ON SCAN. ONLY ONE AVAILABLE FOR SALE.